June 2010: Web site is updated. Hesham El Gamal received the B.S. and M.S. degrees in Electrical Engineering from Cairo University, Cairo, Egypt, in 1993 and 1996, respectively, and the Ph.D. degree in Electrical and Computer Engineering from the University of Maryland at College Park, MD, in 1999. From 1993 to 1996, he served as a Project Manager in the Middle East Regional Office of Alcatel Telecom. From 1996 to 1999, he was a Research Assistant in the Department of Electrical and Computer Engineering, the University of Maryland at College Park, MD. From February 1999 to December 2000, he was with the Advanced Development Group, Hughes Network Systems (HNS), Germantown, MD, as a Senior Member of the Technical Staff. 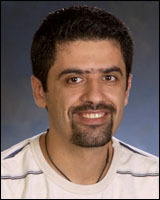 Since January 2001, he has been with the Electrical and Computer Engineering Department at the Ohio State University where he is now a Professor. He held visiting appointments at UCLA, Institut Eurecom and served as a Founding Director for the Wireless Intelligent Networks Center (WINC) at Nile University (2007-2009). He is a Fellow of the IEEE and a recipient of the HNS Annual Achievement Award (2000), the OSU College of Engineering Lumley Research Award (2003,2008), the OSU Electrical Engineering Department FARMER Young Faculty Development Fund (2003-2008), The OSU Stanley E. Harrison Award (2008), and the National Science Foundation CAREER Award (2004). He holds 12 patents and has served as an Associate Editor for the IEEE Transactions on Communications (2001-2005), an Associate Editor for the IEEE Transactions on Mobile Computing (2003-2007), a Guest Editor for the IEEE Transactions on Information Theory special issue on cooperative communications (2007), a member of the SP4COM technical committee (2002-2005), a co-chair of the Globecom'08 communication theory symposium, and a co-chair of the 2010 IEEE Information Theory Workshop. He currently serves as an Associate Editor for the IEEE Transactions on Information Forensics and Security and a guest Associate Editor for the IEEE Transactions on Information Theory. This website is under construction. Last update: June 2010. List of preprints and papers can be reached from the publications menu.